This post title totally deserves that added exclamation point. In fact this post might contain an excessive use of exclamation points –you have been warned! I teased you at the beginning of the month with a post about my New Year’s Day brunch that included a waffle bar for my guests. Well, today I am ready to share the best waffle recipe with you. Let me back track just a minute. My wonderful husband got me the KitchenAid Proline Waffle Baker for Christmas and we have been Leslie Knoppin’ it up over here just about every weekend. As you know breakfast is my favorite meal and I love the giant Belgium style waffles you can get at restaurants. While I have a regular old four square waffle iron I always felt the waffles it made were a little, I don’t know, boring. What I really wanted were the waffles with the giant craters to catch all that butter and syrup. This waffle baker makes two Belgium style waffles at once. In less than four minutes. Seriously! My family has sacrificed for you guys. My family has put up with eating waffles almost every weekend this year. Don’t you feel sorry for them? Eating and testing waffle recipes every weekend for a month?! Okay, don’t feel too sorry for them. I haven’t heard any complaints yet. In fact when I was getting ready to snap some photos of the waffles Kasper exclaimed “Waffles! I try some!” I tried to distract him with Daniel Tiger but that only worked for about fifteen seconds and he loves Daniel Tiger. In fact that little bit of green at the top of the photo is a plate that he grabbed so he could have his own portion of waffles. These waffles aren’t the traditional yeast Belgium waffles, I still need to work on a better recipe for that. What these are are light and airy, buttery and crispy, and ever so slightly sweet. Gently folding in whipped egg whites helps keep the batter light and you avoid the dense waffle that leaves you in a post waffle eating coma. 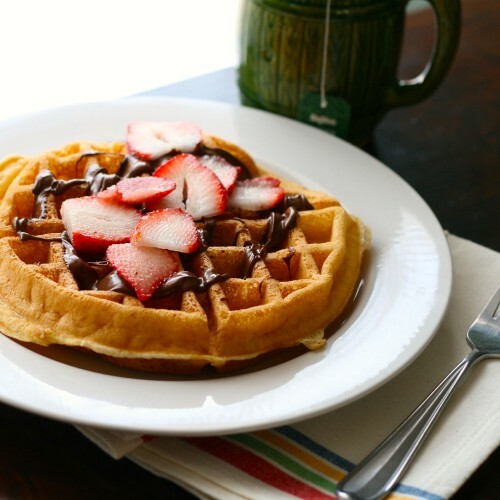 All those crispy waffle craters are perfect for topping with Nutella and strawberries –my current favorite topping. 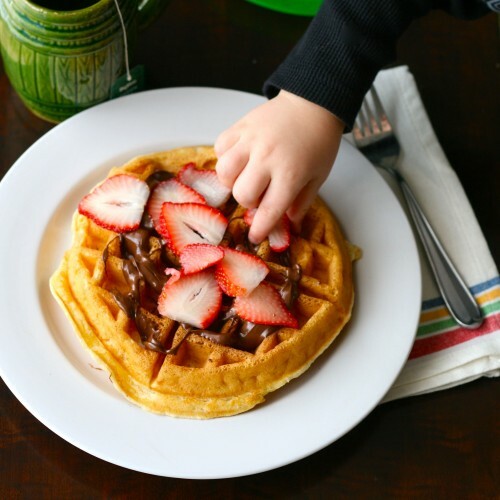 I have had so much fun testing and retesting this recipe and watching my children decide which combination of fruit and toppings they will put on their waffle. 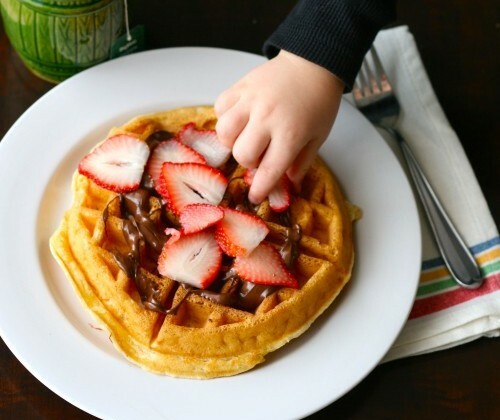 These are the waffles that I hope twenty years down the road my grandchildren are talking about –they are that good! I hope your family and friends enjoy them as much as we have. I vow to have more waffle bar brunches this year. In a large mixing bowl whisk together flour, corn starch, baking powder, and salt. Stir in the wet ingredients until just combined. Pour batter into preheated waffle iron and cook for 3-4 minutes until golden. Oh my gosh I don’t feel sorry for them! First of all, your husband is amazing. I want that waffle maker. 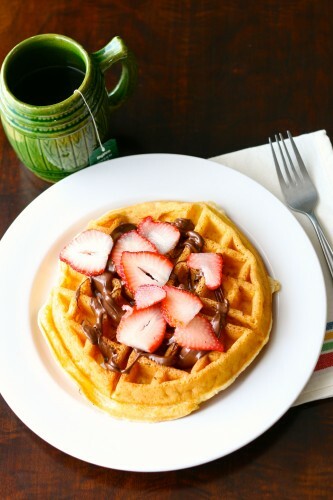 Love love waffles and I can’t wait to try this! We would welcome you with open arms Pamela! The strawberries sure help brighten up a dull winter. My problem with traditional belgian waffles is that they are not crispy. so these waffles sound like the perfect mix. plus they look amazing as well. yum!! They are perfectly crispy! I hope you enjoy them.